With the Fear of God, with Faith, and with Love, draw near. 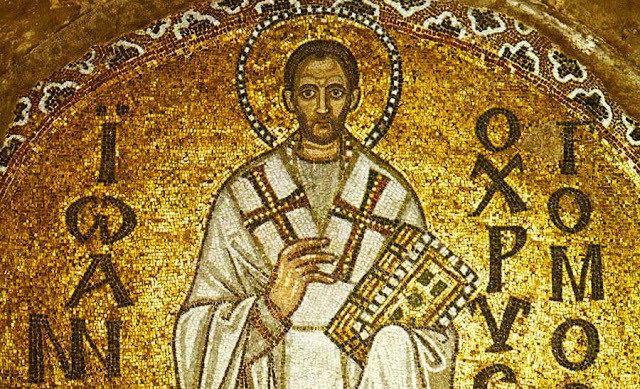 The Paschal sermon of St. John Chrysostom is read aloud in every Orthodox parish and monastery on the morning of the Great and Holy Pascha of our Lord and Saviour, Jesus Christ. According to the Tradition of the Church, no one sits during the reading of St. John's sermon, but all stand and listen with attentiveness. If any man be devout and loveth God, let him enjoy this fair and radiant triumphal feast. If any man be a wise servant, let him rejoicing enter into the joy of his Lord. If any have laboured long in fasting, let him how receive his recompense. If any have wrought from the first hour, let him today receive his just reward. If any have come at the third hour, let him with thankfulness keep the feast. If any have arrived at the sixth hour, let him have no misgivings; Because he shall in nowise be deprived therefore. If any have delayed until the ninth hour, let him draw near, fearing nothing. And if any have tarried even until the eleventh hour, let him, also, be not alarmed at his tardiness. For the Lord, who is jealous of his honour, will accept the last even as the first. He giveth rest unto him who cometh at the eleventh hour, even as unto him who hath wrought from the first hour. And He showeth mercy upon the last, and careth for the first; And to the one He giveth, and upon the other He bestoweth gifts. And He both accepteth the deeds, and welcometh the intention, and honoureth the acts and praises the offering. Wherefore, enter ye all into the joy of your Lord; Receive your reward, both the first, and likewise the second. You rich and poor together, hold high festival! You sober and you heedless, honour the day! Rejoice today, both you who have fasted and you who have disregarded the fast. The table is full-laden; feast ye all sumptuously. The calf is fatted; let no one go hungry away. Enjoy ye all the feast of faith: receive ye all the riches of loving-kindness. Let no one bewail his poverty, for the universal Kingdom has been revealed. Let no one weep for his iniquities, for pardon has shown forth from the grave. Let no one fear death, for the Saviour's death has set us free. He that was held prisoner of it has annihilated it. By descending into Hell, He made Hell captive. He embittered it when it tasted of His flesh. And Isaiah, foretelling this, did cry: Hell, said he, was embittered when it encountered Thee in the lower regions. It was embittered, for it was abolished. It was embittered, for it was mocked. It was embittered, for it was slain. It was embittered, for it was overthrown. It was embittered, for it was fettered in chains. It took a body, and met God face to face. It took earth, and encountered Heaven. It took that which was seen, and fell upon the unseen. 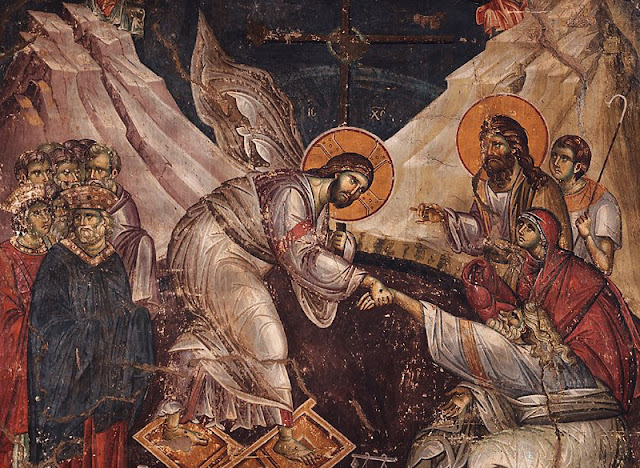 Christ is risen, and thou art overthrown! Christ is risen, and not one dead remains in the grave. For Christ, being risen from the dead, is become the first-fruits of those who have fallen asleep. To Him be glory and dominion unto ages of ages. Welcome to Eastern Orthodox Spirituality (EOS). The purpose of this website is to enrich your knowledge of the Orthodox mindset as well as to act as an aid in whichever crosses you may be carrying. Here you will find articles, sermons, and letters written by saints of the Orthodox Church as well as its other educators, primarily clergy, monastics, and laity both past and present. The best is done to cover a variety of topics as well as include pictures or icons in each document which are relevant to the topic being read. If you would like to request more information on a certain topic, please do not feel hesitant to contact us. It is our hope and prayer that this website will further open your heart to Christ as well as enrich your understanding of the mindset of the Orthodox faith. 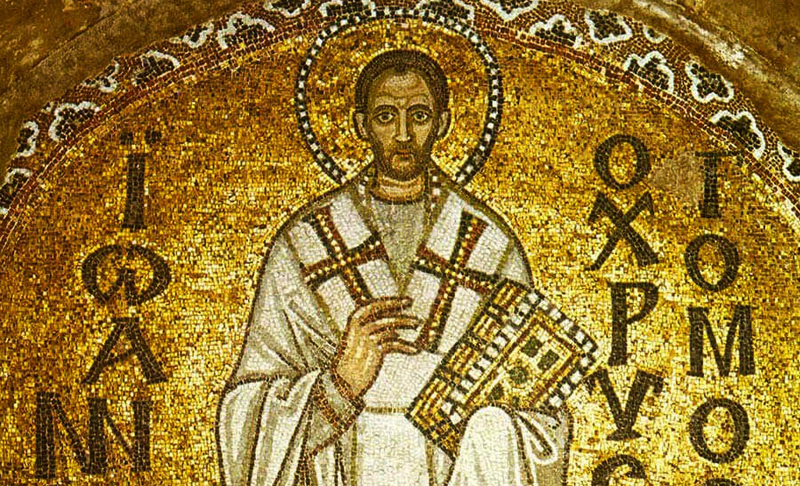 ΣΕ ΥΜΝΟΥΜΕΝ / WE PRAISE YOU • π.Αθανάσιος Σ.